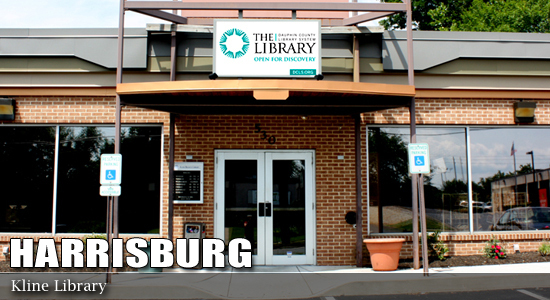 The Kline Library is at 530 South 29th Street in Harrisburg. Proceed up Market Street until it ends at South 25th. Bear right onto South 25th, through the traffic light at the Kline Plaza. At the next set of lights, turn left onto Rudy Road. Turn right at the first stop sign onto South 29th. Take 19th Street exit. Bear left onto 19th. Turn right onto Derry Street. Turn left onto 29th Street. Take Paxton Street exit. Proceed down Paxton Street to 29th. Parking is available in designated handicapped spaces in the front parking lot. There is ample parking behind the library. Opened in 1967 as the Kline Village Branch. Copyright 2018 Dauphin County Library System. All rights reserved.